Positioned at the peak of Croatia’s stunning Punta Skala peninsula and located within the exclusive Falkensteiner Hotels and Residences Punta Skala resort, the Falkensteiner Hotel and Spa Iadera certainly isn’t short of things to be proud of. 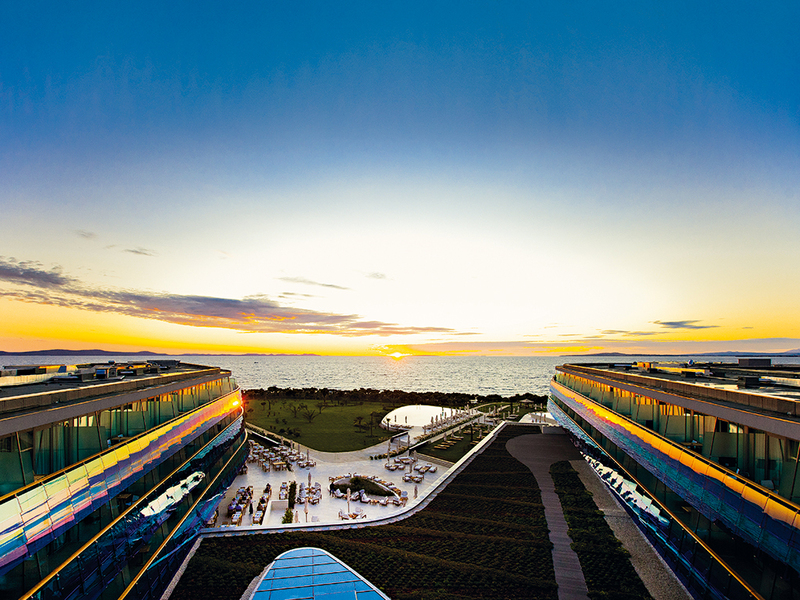 From its mesmerising views of the Adriatic Sea and the nearby collection of islands to its enviable Mediterranean climate, the resort is becoming a must-visit destination for business travellers looking to experience something a little different. Located only 28km from Zadar International Airport, the hotel and spa is a conveniently placed paradise on the edge of the Croatian landscape. Contemporary design and state-of-the-art technology flow through the stylish accommodation, and guests will find exceptional service on offer for even the most demanding business trip or event. Punta Skala itself acts as one of the hotel’s most inviting assets. The surrounding landscape and magnificent sea views offer guests a pristine, refreshing retreat, providing an exquisite haven in the very heart of Europe. Iadera prides itself on its commitment to providing such welcome respite in the midst of the fast-paced business world. A combination of breathtaking vistas, comfortable accommodation and superb facilities makes it the ideal venue for doing business in when visiting beautiful Croatia. Adriatic sounds and colours blend seamlessly with the sophisticated design and high-specification technology in the hotel’s 600sq m business centre. Setting a premium standard in the meetings sector, Iadera’s conference facilities include state-of-the-art communication tools and a relaxed, revitalising environment that is matched in few other destinations around the world. Promising to make every meeting, conference and banquet an extraordinary success, the resort’s business facilities provide the Iadera resort with an entirely different appeal. The centre’s modern layout includes a separate entrance and its own foyer, creating a detached unit that guarantees guests privacy and a secluded area in which to focus solely on the task in hand. Teamed with the area’s peacefulness and natural beauty, the conference centre is the ideal location for all manner of business events. The centre’s seven conference rooms are fully equipped with state-of-the-art communication and presentation technology, including full soundproofing, air conditioning, overhead projectors and microphone systems. Additionally, the resort’s MICE coordinator will be permanently on hand to discuss key details of the event and its requirements, acting as a personal contact during the entire visit. With Iadera’s primary aim being to provide a successful and smooth-running event, this service is one of the business centre’s most beneficial, and most valued. Through the conference centre’s foyer guests have direct access to the Sotto Voce Lounge Bar terrace, which prides itself on its unique selection of gins from all across Europe. Easy access to this venue provides visiting businesspeople with an opportunity to recuperate and socialise with friends and colleagues after a day in the boardroom – but it is not the only dining option available. Specialising in Alpine-Adriatic cuisine, Iadera boasts a collection of seven bars and restaurants, including a beach hut bar and a sophisticated cigar lounge. Elsewhere in the resort is another of Iadera’s stunning attractions: the Acquapura Spa spans over 6,000sq m, making it one of the most exclusive and beautiful places of its kind in Croatia. Custom-made spa therapies are available and facilities include a wellness garden, an infinity pool and Turkish hammam. This luxurious and spacious area is certain to complete the business experience, ensuring that all guests and clients are relaxed and rejuvenated upon their departure.